Disclaimer: Party City provided us with items to put together this story, however all opinions are our own. I personally LOVE summer! I think it’s the best time of the year. 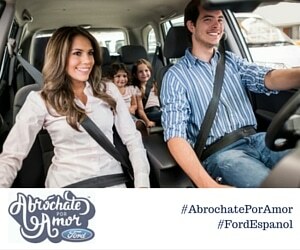 Vacations, trips to the beach, lazy mornings and longer evenings, what’s not to love? In my quest to celebrate summer and keep my children entertained, I’ve invented mini-summer parties. They are small gathering of my children’s friends and their parents. We hang around, chat, eat and enjoy life. Sounds relaxing and easy right? Ok, so it’s not that simple. I’m not one who knows how to plan a “small” gatherings. Our summer fiestas have turned into extravaganzas. 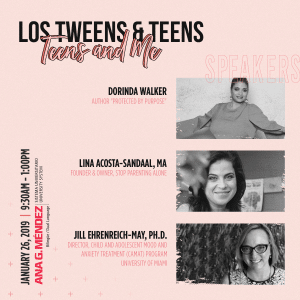 Whether we have two families over or six, I have the inner desire (let’s call it the Latina gene) to be sure everyone is well fed, the house is clean and there are activities to keep everyone entertained. Lucky for me, my friends at Party City have plenty of items to keep me stocked, ready and creating! Also, now is a perfect time to plan an “End of Summer” party! It can be a final celebration before the kids go back to school and we get our sanity back! Mix four drops of blue food coloring into the white frosting and mix thoroughly (add more drops of food coloring for a darker color). Top each cupcake with the blue frosting. Using a food processor, chopper or a plastic bag and a mallet, crush a handful of Teddy Grahams to make the “sand.” Sprinkle the sand on one half of the cupcake. Top the sand with a piece of the sour belts and lay a Teddy Graham on top (you may need to put a drop of frosting on the back of the Teddy Graham to get him to stick). 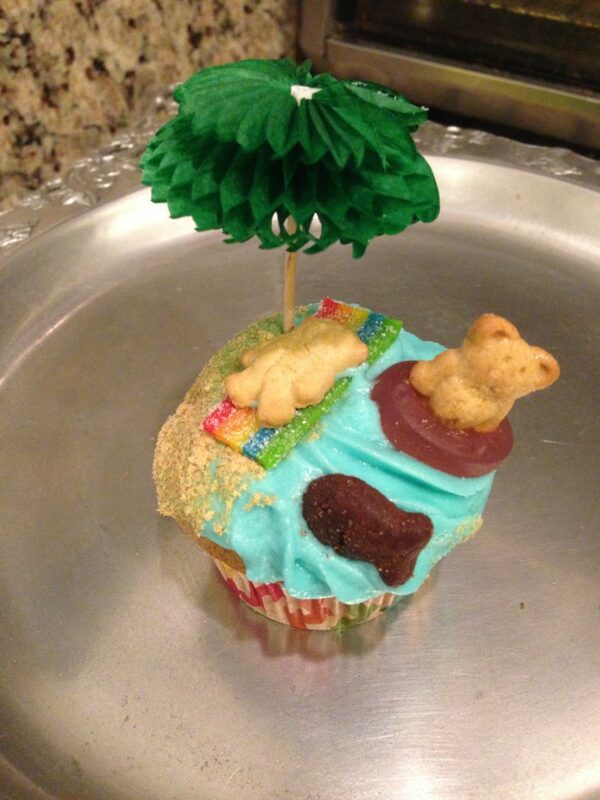 Now, place a Gummy Lifesaver in the “water” portion of your cupcake and top with a Teddy Graham. Then add the chocolate cookie Goldfish to your water. Finally, place the Palm Tree Party Pick in the beach portion to give your lounging teddy bear some shade! Confetti, streamers, stand-ups and more come in Party City party kits and they are super cute! Check out the photo of the tablescape from the beginning of summer party above. My secret to party planning is the Party City web site. You can search your theme and see every item that matches. I don’t have to run to a store, figure out which colors go with which items or carry everything home. 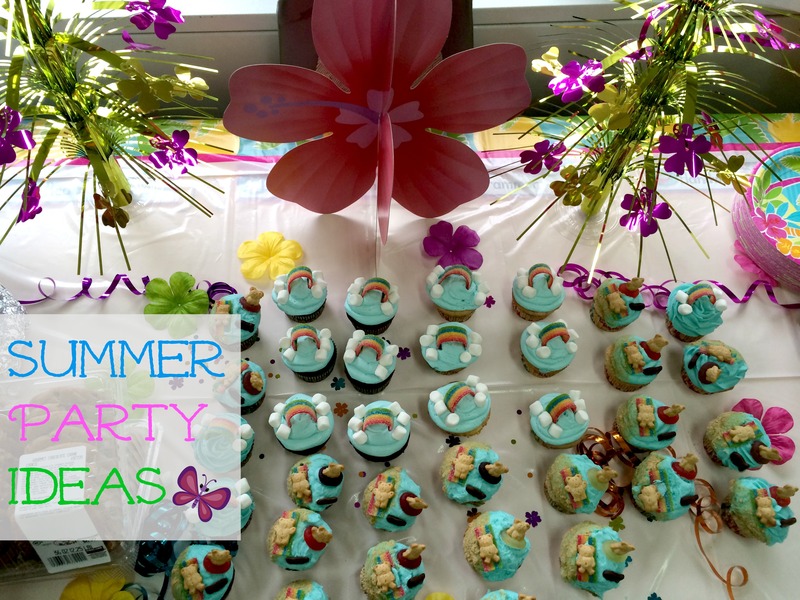 Check out all of their “Summer Scene” Party Items. You should consider purchasing a party pack which contain more items for less – that way you’ll have plenty of plates, napkins and cups no matter how many people you invite! Enjoy your summer, end of summer or “yay! the kids are going back to school” party! 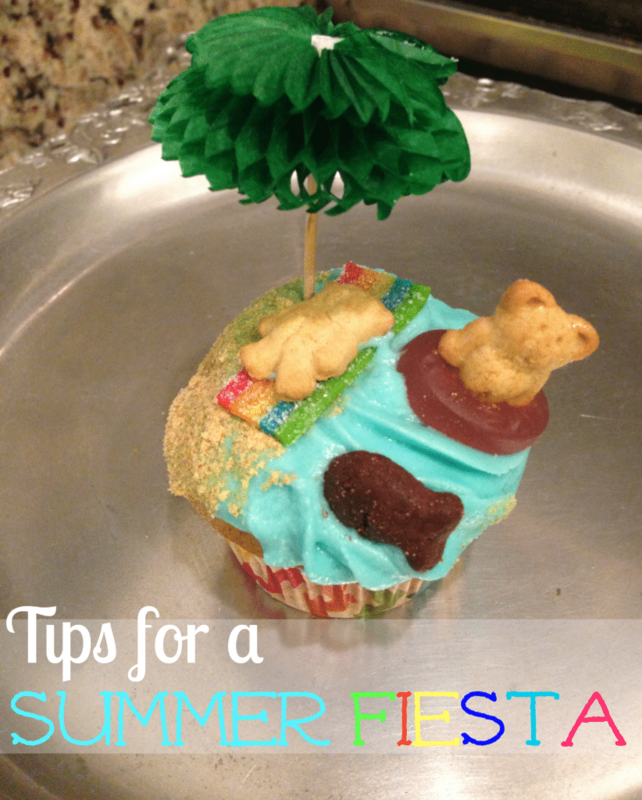 This entry was posted in Ideas, Recipes and tagged cupcake decorating, Decorating, Party, Party City, summer, summer cupcake, summer party. Bookmark the permalink.